Camping du Lac de Ribou is a campsite in Cholet, Maine-et-Loire, located by a lake/recreational pond.The campsite has which are marked out, pitches with shade, pitches without shade and pitches with some shade. It is possible to rent apartments and bungalows. The campsite has a playground. For sportive holidaymakers the camp site offers various cycle routes. There is an entertainment programme. The camp site has an outdoor swimming pool, an indoor pool with sliding roof and a toddlers' pool. There is also water slide. At Camping du Lac de Ribou you can go windsurfing. You don't always have to cook, as the camp site has a snack bar. The camp site also supplies fresh bread. You can also use the internet, as there is a WiFi point and you can access the internet with your own laptop in 80% of the camp site. "Large family campsite with many activities for young and old." No longer accepting ACSI but still not expensive. Reception staff friendly and helpful and facilities clean. Good location for overnight stop off. We stayed for 2 nights on route to south of France. Very nice site and quiet at night. Swimming pool is great, kids loved the slides after a long drive. Location of the site is very good. Shopping complex like Thurrock in the UK. We went out to the American dinner Memphis which was very reasonable and served a good stack. Reception on site was very good. Only one problem there is no sign at the front of the site to say you have arrived. Would recommend this site and would use again. 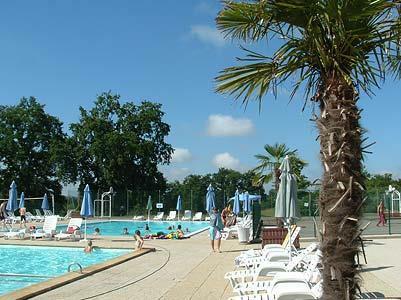 Would you like to book Camping du Lac de Ribou or request more information? You can do both using the information below. Clearly signposted in the centre. ACSI Eurocampings will send your information request to "Camping du Lac de Ribou".